Some say you're indulgent. Others say impatient. We disagree. You're just someone who likes to get to the juiciest parts first. That's why there's a fast-forward button on TiVo, after all. It also explains why you're going to love Spikeball, a game that we've seen cropping up all over North Avenue Beach this year. It's like the filet mignon of volleyball, the sport trimmed down to its juiciest essentials: serving and spiking. 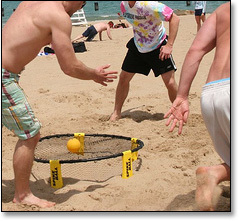 Technically, Spikeball's not new. The original manufacturer abandoned its claim long ago, so an enterprising cadre of thirtysomething Kankakee-bred friends revived a bit of their youth by marketing a new, improved version. The rules are certainly ADD-friendly. A taut Hula Hoop-sized net is placed at ankle level between a pair of two-player teams. You smack the palm-sized ball down on the net so it ricochets up at your opponents. They have three hits between them to control it and bounce it back to you. When they miss, you score. First team to 21 wins. If you're after action, Spikeball offers plenty—you'll go nose-to-nose with your opponent, with no huge net to keep border security (and kill your competitive buzz). Plus, the game fits into its own backpack, making it easy to take with you during your post-game carousing. Which, of course, remains the best part of the beach.